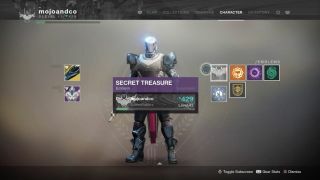 With the latest expansion to Destiny 2, Forsaken, Bungie has promised a return to the mystery and miasma of the original Destiny in 2014, and our discovery of the recent Mindbender secret chest in the campaign suggests the studio has already lived up to that pledge with aplomb. Don't know what we're talking about? Around halfway through the campaign, during a seemingly innocuous boss fight against the Mindbender Baron, players can acquire a super secret Emblem and Triumph from a hidden chest within The Hall of the Exalted. Unlocking the chest is a simple process, but one that’s easy to miss when blasting through Forsaken’s campaign at full speed, so here’s how to to do it. First off, you’ll need to have access to The Mindbender Adventure in The Tangled Shore, the first of Forsaken’s new planetary zones. This can be unlocked once you’ve completed the first three missions in Forsaken’s story campaign, at which point all six Baron Adventures will be made available for undertaking, including the Mindbender’s. Be warned, Bungie’s recommended Power Level for this quest is 430, so make sure you’re at least 425 or above to have a good shot at defeating him. Progress through the Adventure as normal until you reach the last, final boss fight with the Mindbender himself. After taking a few pot shots at him and his minions, he’ll eventually lure you into his own, Ascendant realm through a portal. Make note of that portal, it’ll be important later. Once you’ve defeated the Mindbender for good, his Ascendant Realm will start to collapse in on itself, and your ghost will prompt you to escape back through the portal you first came through before it’s too late. But hold on. Just to the right of said portal, you can spot a floating platform hovering off the arena’s edge, barely visible in the enveloping darkness. Jump onto it, and carefully follow the series of floating platforms to the top, where you’ll come across a floating orb called a Key. Grab it, jump down from the platform, and head back through the portal. The mission will come to an end, but you shouldn’t leave this area yet. Instead, head towards the door located up the stairs to your right, and use the key to unlock it. There, a chest will await your arrival, and you’re free to open it up to score the Secret Treasure Legendary Emblem, which decks out your character profile with the Mindbender’s head and an ominous Hive theme. Opening the chest also completed the Hiving in Plain Sight Triumph, but make sure to redeem it in your Triumps menu to redeem the 100 points that it awards your Guardian. And that’s it. The Mindbender’s dead and his last secret has been uncovered, with your Guardian all the better for it now that a permanent memento of his defeat is sprawled across your in-game Character Profile. For more Destiny 2 walkthroughs, guides, tips and tricks, make sure you visit our Destiny 2 guide hub, or if you're after some general help then check out our Destiny 2 tips for the things we wish we knew before we started playing.